Mainland star Tiffany Tang Yan yesterday attended the press conference for the Sa Sa Ladies' Purse Day next month as its image ambassador. Also in attendance were Yumiko Cheng Hei Yi, Selena Li, Jacquelin Chong, Kathy Yuen (Tong Yi) in image consultant Mayao Ma's design. Tang Yan said that she worked with Tony Leung Chiu Wai for the first time on their new film PARIS RAIDERS (AU JAU GUNG LEUK). Tang Yan was shy with Wai Jai that she did not dare to look at his eyes. She also praised him as a the idol of everyone and a real "god". At night she would fly to Italy to continue work on the film. Tang Yan in the film played a couple with Wai Jai. Would they have any intimate scene? She bashfully said, "A little. (Did you fall under Wai Jai's spell?) Yes, any girl would like him. The first time I saw him in persona I was so shy that I didn't dare to look directly into his eyes. He wasn't cold, very friendly. (Is he your idol?) He is everyone's idol, a real god. I am very lucky to be working with him." Speaking of how Wai Jai's double closely resembled him in the film, Tang Yan admitted, "The first time I saw him I really was surprised. Yet when they were together they were very different. 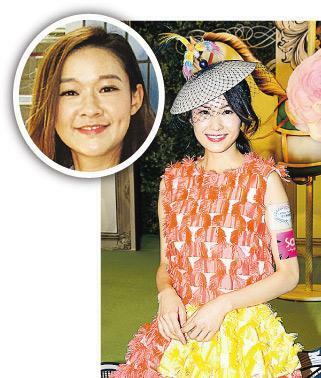 Not everyone can have Leung Chiu Wai's charm."